Northeast Wrestling returns to the NEW Arena 40 Peck Road, Bethany, Connecticut on Saturday, December 9th - 7pm. 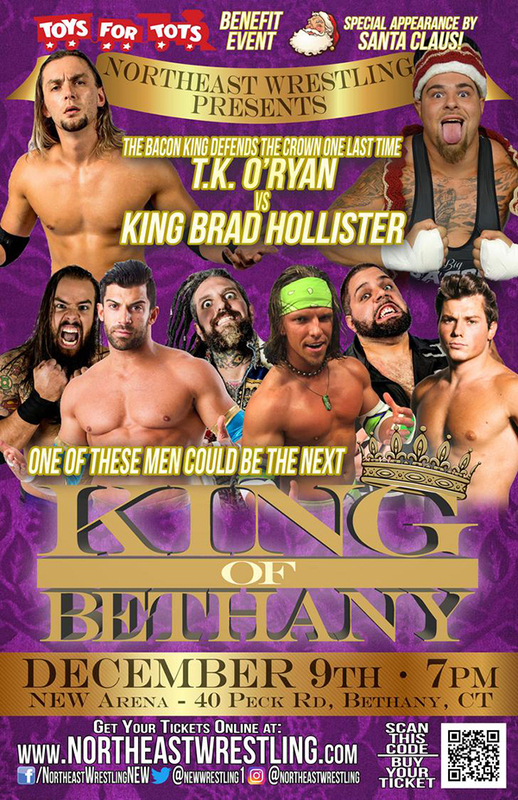 King Brad Hollister defends the Crown for the very last time against a man that many Northeast Wrestling fans at the NEW Arena consider the unofficial King of Bethany - Current Tag Team Champion and former NEW Champion - TK O'Ryan. The crown will be on the line and if Brad Hollister wins the NEW Title on Dec. 1st in Waterbury, Connecticut at Holiday Havoc - The NEW Title will also be on the line. See this battle between former best friends and tag team partners. This is a MEGA event that you don't want to miss. It is the 22nd Anniversary of our first event in Montgomery, NY on Dec. 9, 1995. 2 Other superstars to be announced. A Special Appearance by Santa Claus and his Elves. This is also our annual holiday spectacular and a Toys for Tots - Fundraising event. The Marines will be in attendance that day. We ask all of our fans to help those in need to bring an unwrapped toy and support Toys for Tots this holiday season. Tickets start at only $15 and are going fast pick up yours now at www.northeastwrestling.com or at the door on Saturday, December 9th.